Asian markets tumbles especially Nikkei lost more than 3% on strong yen and global growth concern. Wall Street has closed lower on declining US bond yields. US 3- month and 10 year has inverted for first time since 2007.The yen was trading higher against all majors especially against USD and gained more than 100 pips from high of 110.89 made on Friday. US markets has closed lower with Dow Jones at 25550 (1.77% lower) and S&P500 2800 (1.90% lower).Nikkei hits intraday low of 20908 and is currently trading around 20928. 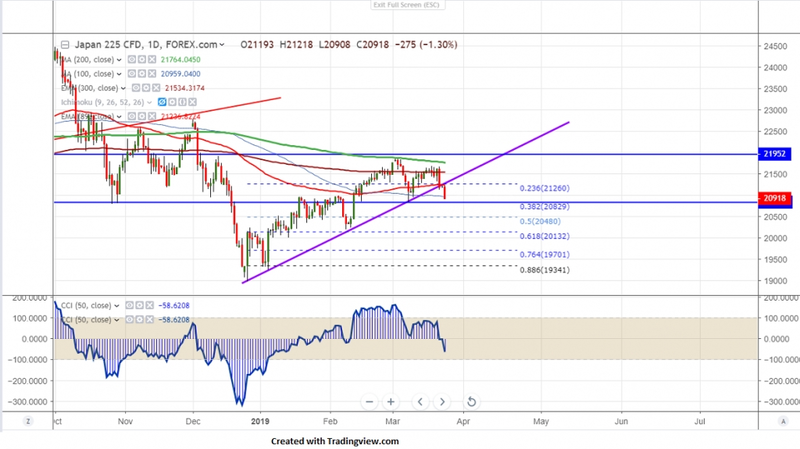 On the lower side, near term support is around 20800 and any break below targets 20480/20350/20185. The near term resistance is at 21220 and any break above targets 21400/21540. It is good to sell on rallies around 21220-250 with SL around 21430 for the TP of 20480.